The defending tournament champions started the boys basketball tournament off with the expected bang. The Newport Central Catholic Thoroughbreds (18-3) handled the Owensboro Catholic Aces, 60-39 to open the All “A” State Tournament on Thursday. All games are taking place at the Frankfort Convention Center. The end result did not turn out the same for the previous six senior classes. 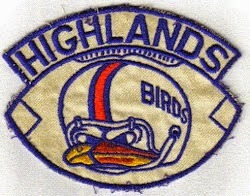 But the senior class of this past football season did what it could to add to the great history of Highlands Bluebird football. The Bluebirds rank second in the nation for the most wins in school history with 855 dating back to 1915. Valdosta (Ga.) is first with 882 victories since 1913. The Newport Central Catholic Thoroughbreds had no problem in the All “A” Girls State Basketball Tournament opener on Wednesday. The Thoroughbreds (18-2) dominated the Paintsville Lady Tigers (11-7) by a 56-26 count at the Frankfort Civic Center. They jumped out to a 27-3 advantage after the first quarter and never looked back. G. Michael Graham Photo. Highlands senior Drew Houliston (25) passes the ball against Newport Central Catholic junior Grant Moeves (13) in Tuesday's 36th District contest. NewCath won 56-28 for its eighth straight win in the series. NEWPORT – Lately, the home team had dominated the series. The visiting team sought a signature win in building toward the time when these two men’s basketball teams battled for not just district titles, but 9th Region crowns between 1997 and 2001. The Newport Central Catholic Thoroughbreds (17-3 overall, 3-0 district) continued that against the Highlands Bluebirds (3-10, 1-2) with a 56-28 victory on The Hill on Tuesday. The Highlands Bluebirds girls basketball team completed its undefeated run through 36th District regular-season play Monday. The Bluebirds handled the host Bellevue Lady Tigers, 67-31 to finish 4-0 in district play and clinch the top seed in the district tournament in February at Newport Central Catholic. Highlands improved to 14-3 overall and Bellevue dropped to 7-9 overall. Another year marked another All “A” 9th Region title for the Royal Blue and Gold. The Newport Central Catholic Thoroughbreds handled the in-town rival Newport Wildcats, 67-40 for the crown at Dayton on Saturday. It was not as close as last year’s region title game at Bellevue that NewCath had to hit a good amount of free throws down the stretch to pull away. This was supposed to be their biggest challenge in the tournament. All the Newport Central Catholic Thoroughbreds boys basketball team did was respond with an 83-67 victory over the St. Henry Crusaders in the All “A” 9th Region semifinals Friday at Dayton. NewCath (15-3) has won eight in a row and moved to 10-0 in region action. The Highlands basketball games scheduled for Thursday have been cancelled because of frigid temperatures. Junior post Drew McDonald scored his 1,000th career point in helping the Newport Central Catholic Thoroughbreds to victory Wednesday. The Highlands girls basketball game scheduled for tonight against Boone County has been rescheduled. The Newport Central Catholic Thoroughbred boys basketball team had little trouble in the All “A” 9th Region opener Monday. NewCath handled the Bellevue Tigers, 82-24 at Covington Holy Cross. The Thoroughbreds moved to 8-0 against 9th Region competition. They had to overcome a slow start. But the Newport Central Catholic Thoroughbreds pulled away in the fourth quarter for a 49-39 win over the Beechwood Lady Tigers to claim their eighth straight All “A” 9th Region championship. NewCath (17-2) will take on 15th Region champion Paintsville (10-6) at 5 p.m. at the Frankfort Convention Center on Jan. 29 to open the tournament. G. Michael Graham Photo. Newport Central Catholic junior Loren Zimmerman (right) guards Holy Cross' Aleah Tucker in Friday's All "A" 9th Region semifinal contest. The Thoroughbreds won 39-37 in the final seconds to advance to the title game. ERLANGER – Some may call it the Newport Central Catholic Invitational. It is understandable because the Thoroughbreds have won the previous seven All “A” 9th Region girls basketball crowns. But one region opponent has not been intimidated by that in recent years in the Covington Holy Cross Lady Indians (11-4). Holy Cross gave NewCath its closest game in last year’s tournament losing just 51-43 in the first round. It took the Thoroughbreds (16-2) the final seconds of this year’s semifinal contest Friday to beat the Lady Indians, 39-37 at St. Henry. The Highlands basketball games for Thursday have been cancelled because of cold and snowy weather. Now that the big decision has been made, they are back hard at work preparing for the 100th season in school history. The returning Highlands Bluebirds football players hit the weight room for winter conditioning immediately after the school promoted Brian Weinrich to Head Coach filling in for the retired longtime Head Coach Dale Mueller. Weinrich had been on staff the previous 19 seasons including Defensive Coordinator since 2002. The Newport Central Catholic Thoroughbreds girls basketball team advanced to the All “A” 9th Region semifinals with another sound win. G. Michael Graham. Highlands senior Brandon Hergott (32) goes up for a score against Newport's Ethan Snapp in Tuesday's 36th District contest. Hergott scored 16 points in the Highlands loss. NEWPORT – They hoped to show how far they’ve come despite their record. That’s especially because the Highlands Bluebirds boys basketball team might have to face the Newport Wildcats for the right to head to the 9th Region Tournament later in the season in the 36th District Tournament. But the host Wildcats prevailed in this one 65-53. The Newport Central Catholic Thoroughbreds girls basketball team had no problems in the opener of the All “A” 9th Region tournament Monday on The Hill. NewCath (14-2) pounded the overmatched Villa Madonna Blue Lightning (7-6) by a 51-29 count. The Thoroughbreds have won the last seven All “A” region crowns. The Highlands Bluebirds boys basketball team (2-8) fell to 0-4 in 9th Region action with a 58-51 loss to the Cooper Jaguars (8-6) on Saturday. Highlands had two players reach double-digits. They were Brendan Buten and Brandon Hergott with 20 and 11 respectively. G. Michael Graham. Highlands point guard Haley Coffey brings the ball upcourt in Friday's game against Notre Dame. The Pandas won the 2013 9th Region title game rematch, 67-59. A couple big things needed to happen for the Highlands Bluebirds girls basketball team to pull off another big win. They did not allowing the Notre Dame Pandas to leave Fort Thomas with a 67-59 9th Region win Friday. This game marked the first meeting since the 9th Region title game at Northern Kentucky University in March that the Pandas won 63-44 on March 4, 2013. Notre Dame finished state runner-up last year before Head Coach Nicole Levandusky left for Cooper. The Newport Central Catholic Thoroughbreds girls basketball team followed up a big win Wednesday with a bigger one Thursday. After handing rival Bishop Brossart its first loss Wednesday in Alexandria, the Thoroughbreds (13-1) ventured to Independence and beat the 8th Region contender Simon Kenton Lady Pioneers (13-3), 72-50. NewCath had lost the previous two meetings against Simon Kenton. G. Michael Graham Photo. Newport Central Catholic's Stephanie Lewis (middle) pulls down a rebound in Wednesday's win over Bishop Brossart. Lewis scored eight points in the win. ALEXANDRIA – There are no more undefeated girls basketball teams left in the Commonwealth of Kentucky. The Newport Central Catholic Thoroughbreds took care of the last of them Wednesday with a 50-40 victory here over the Bishop Brossart Lady Mustangs (11-1). The Thoroughbreds (12-1) grabbed the lead in the second quarter with an 8-0 run and never looked back. The Highlands basketball games scheduled for Tuesday have been postponed because of frigid temperatures. The Newport Central Catholic Thoroughbreds had a game scheduled at the Newport Wildcats (6-4) tonight. G. Michael Graham Photo. Highlands guard Drew Houliston (25) looks to make a move on Covington Catholic's Ben Heppler (24) in Saturday's 9th Region game while teammate Luke Brockett (21) gets in position. The Colonels won 67-29. The Highlands Ladybirds basketball team did not suffer a letdown Saturday. Highlands (10-2) followed Friday’s big win at Newport Central Catholic with a 60-50 win over the Green County Lady Dragons (5-5) in the Centria Metals/Staxx BBQ Shootout at Franklin County. The Lady Birds have won two in a row. The Newport Central Catholic Thoroughbreds boys basketball team crossed the Licking River and brought back a convincing victory Friday. The Thoroughbreds (9-3) pounded the Covington Holy Cross Indians (3-9), 72-36 in 9th Region action. NewCath moved to 4-0 in region play with the win.